HomeErosion control to protect River Bank in Maluku, Indonesia. 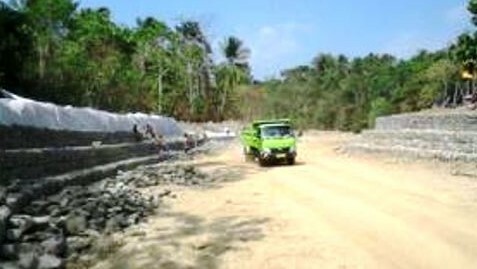 Erosion control to protect River Bank in Maluku, Indonesia. Discover how hydraulic erosion control solution using Gabions, Reno Mattresses and MacTex MXL worked to mitigate River Bank Erosion in Maluku, Indonesia. Way Lola Kecil is located in the North-East of Seram Island, Maluku Province of Indonesia. An unconfined river body was threatening the surrounding areas that house a large local community, with frequent floods coming during the rainy season. The objective was to build a dike in order to confine the high water flow level to avoid the flooding of the areas in its vicinity. The dike was designed to be built with locally available loose soil (mainly silty sand). The Public Works Department decided therefore to build the dike and to cover it in with a durable and flexible revetment system to prevent the erosion of the fine soil particles. The department ultimately chose to line the entire dike using Gabions and Reno Mattresses. According to the test results gathered during the Colorado State University hydraulic test campaign, Reno Mattresses allow for tangential river flow velocities up to 6m/s without any substantial damage. Mattresses are also very flexible modular elements which allow high levels of deformation and settlements without compromising the lining integrity. During the construction phases, the Mattresses lining experienced a severe flood without sustaining visible damage. Reno Mattresses have shown to be a valid alternative to the traditional lining systems used in Indonesia (rip-rap or masonry walls) both in terms of flexibility, durability and cost effectiveness. The new construction dike on the left bank is totally covered with Reno Mattresses (anchored with 1m steel bars) and extended in the river body for approximately 3,5m as scour protection. The right bank has been protected with a gabion wall coupled with Reno Mattresses as toe scour protection. All the products have been installed together with a nonwoven geotextile (MacTex MXL) with filtration function. The new construction dike on the left bank is totally covered with Reno Mattresses (anchored with 1m steel bars) and extended in the river body for approximately 3,5m as scour protection. The right bank has been protected with a gabion wall coupled with Reno Mattresses as toe scour protection. All the products have been installed together with a nonwoven geotextile (MacTex MXL) with filtration function. The solution successful controlled the erosion phenomenon.